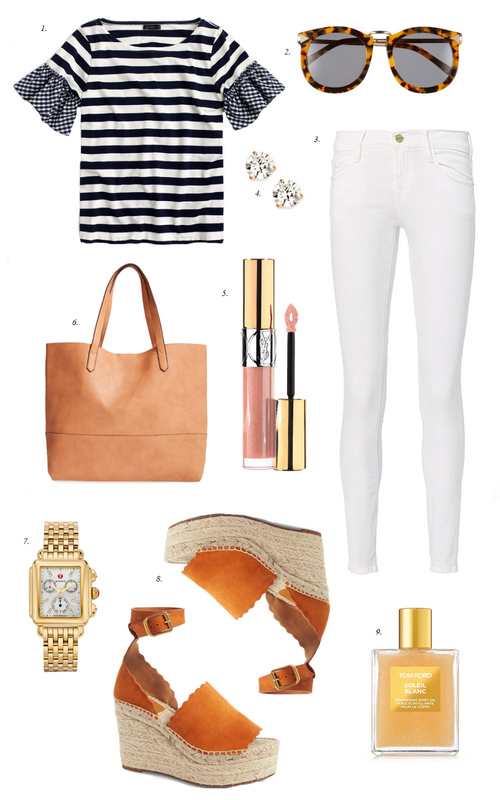 Here’s an outfit I would totally wear all spring long! Plus this top is 30% off right now with code HAPPYSPRING. I love the mixed patterns and the ruffle sleeves! I hope you have a wonderful Wednesday!! I leave you with this question. Do ruffle sleeves taste as good as ruffle chips?….. Thanks Mia! Hope you’ve had a great Wednesday! That top is so stunning! The mixed patterns, the ruffly sleeves, it’s so pretty. I totally agree!! Thanks for stopping by! Such a cute outfit for spring. I have been eyeing that ruffled top, so cute!! What a cute outfit! I love that shirt and how it has a subtle pattern mix going on with the stripes and gingham, which is trending so much this season! I also adore those wedges, too! Thanks for the inspo, beauty, and I hope you’re having a great week so far! I love these picks! Especially those wedges!! Wishing you well & sending love! Loving this spring outfit! That top is super cute and I’m excited it’s on sale. I love that stripped top, and those shoes! Obsessed with those scalloped wedges! I’m getting the Blanc Soleil dry oil for spring too, can’t wait to wear it on my shoulders for a glow with off the shoulder tops/dresses! I LOVE the bell sleeves on the top!! So pretty! This is such fun Spring outfit inspiration! I love the fun sleeves on that top! I do too!!! So feminine! Thanks for stopping by Helen! What a lovely selection, love the striped tee! Great suggestion, love your style! Love that top!! super cute! The photos are really very awesome And photos are very good. I am gonna bookmark this page, thanks for the info. I actually appreciate your own position and I will be sure to come back here.